Philosophy is for everyone! This page contains posts about ethics that are aimed at a general audience. No prior knowledge is assumed, though pen and paper will sometimes help. impossible for a voting system to do everything you might hope for. Something has to go, and different democratic systems will make different choices. One idea that is hard to give up is the idea that if every member of society prefers X to Y, then society should be seen as preferring X to Y. But when uncertainty is brought into the picture, even that idea is not convincing. Economists have known this since the 1970s, and the problem has practical implications. On June 23, 2016 the British voters faced the huge decision as to whether to leave the European Union. But no one really knew what leaving would involve, and the options became known as soft Brexit and hard Brexit. Soft Brexit involves keeping close alignment with the EU, hard Brexit means breaking all ties. Here are the views of two typical voters. Ann and Bob have identical views about remaining. They think life would be fine. But they have very different views about leaving. Ann thinks that soft Brexit would be a great outcome. She thinks it would improve the economy a lot, and that’s what she cares about. But hard Brexit, in her view, would be an economic disaster, cutting Britain off from a major trading bloc. In contrast, Bob thinks that a hard Brexit would be a great outcome. He thinks that it increase British sovereignty, and that’s what he cares about. But soft Brexit, in his view, would make Britain a slave to the EU, with no say in the rules. But oddly enough, they both vote “Yes” to leaving. This is because they have different views about uncertainty. Ann thinks that Brexit will probably lead to soft Brexit; economic common sense will prevail. But Bob thinks that Brexit will probably lead to hard Brexit; once they taste freedom, the British people will never be denied. According to standard decision theory, once we have assigned numbers to outcomes, we should calculate the expected value of gambles like voting to leave by multiplying the value of each outcome by its probability, then adding all these quantities up. The gamble with the greatest expected value wins. To make the example concrete, suppose that Ann thinks that if the British people vote to leave, the probability that soft Brexit will result is 80%. Her calculation is as follows. On the other hand, Bob thinks that the probability of soft Brexit is just 20%, so his calculation is this one. So they both put the expected value of leaving at 8, which is higher than the value they assign to remaining, which was 6. So they both vote to leave. In one sense, Ann and Bob are in perfect agreement. We could even imagine that they reflect the electorate at large, containing 30 million Ann’s and 30 million Bob’s. In that scenario, the democratic case for leaving is watertight. Or is it? Ann and Bob are actually in more or less complete disagreement. They disagree about what kind of Brexit is likely, and they disagree about what kind of Brexit would be good. This means that their agreement is what the economist Philip Mongin calls spurious, or what the former reality TV host Donald Trump might call fake. It’s an illusion that results from the quirk of their disagreements cancelling out. But if one is right about everything, the other is wrong about everything. So the case for being impressed by their agreement is actually quite weak. Whether you agree with it or not, the basic idea of democracy is that social decisions should be based on a social consensus. But what is the social consensus in the case of Ann and Bob? One idea is to split the difference. Ann thinks that probability of soft Brexit is 80% and Bob thinks it is 20%, so we might say that 50% represents their consensus about uncertainty. Ann thinks that the value of soft Brexit is 10 and Bob thinks that it is 0, so we might say that 5 represents their consensus about the value of soft Brexit. Similarly, 5 is the consensus of hard Brexit. This gives their various opinions equal weight. That’s less than the value of staying, so it makes a case for saying that the social consensus is to remain. Why shouldn’t that be seen as the will of the people? Here’s another example. In the run-up to the 2016 United States Presidential Election, Hillary Clinton was a known quantity. But Donald Trump was very much unknown. Despite his sometimes outrageous pre-election showmanship, many people were confident that a future President Trump would turn out to be Soft Trump, as they wanted: good on the economy, and socially moderate. Others were confident he would be Hard Trump, as they wanted: nationalist, and socially extreme. This is obviously an over-simplified model. But it is easily conceivable that two large groups voted for Trump for opposite reasons. It is also conceivable that when uncertainty is stripped away, the social consensus in the US was: Soft Trump > Clinton > Hard Trump. In that scenario, as perhaps witnessed by President Trump’s basement-level approval ratings, their version of democracy gave the citizens of the United States their worst possible outcome. When people disagree about both uncertainty and their basic values, voting can behave very strangely. 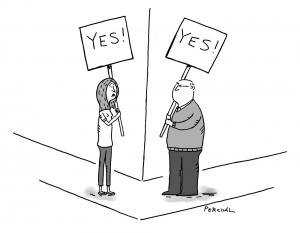 It can look as if everyone agrees what to do when they are actually in complete disagreement. Other natural ways of understanding the social consensus can lead to completely opposite results. The citizens of the United States will eventually get to vote again, but what should be done in the case of Brexit? Sooner or later, we are going to know what Brexit will actually look like. The uncertainty about what kind of Brexit it will be will have vanished, and a second referendum would be a vote on remaining versus the only Brexit that is available. Suppose it ends up being hard Brexit. If there are more Ann’s than Bob’s, the remainers will win. If there are more Bob’s than Ann’s, the leavers will win. Isn’t that a much more sensible interpretation of democracy? There are many kinds of democracy, and when the British Prime Minister Mrs May says that a second referendum would be a “gross betrayal” of democracy, she is actually defending one of the more stupid versions.